AoIR16: Day 1, part 1. Stitching Poetics and #BlackLivesMatter. micha cárdenas‘ plenary, Trans of colour poetics: imagining futures of survival, began with the room collaboratively playing redshift & portal. It’s a beautiful, heartbreaking game, and I was a little surprised by how affecting the collective experience was (“What do you mean leave? NO! STAY AND HELP!“). cárdenas used this as a way of exploring ideas around shifting one’s location and form, and about survival. She reminded us that the conference is taking place on land stolen from Diné and other peoples*, and that Keisha Jenkins is the 21st trans woman of colour to be murdered in the US so far this year: this sets the context for thinking about the need to build spaces where people of colour, and particularly trans women of colour, can survive. This work understands trans women of colour’s knowledge, including their experiences of and responses to violence and surveillance, as central. Trans women need to shift their visibility across contexts: passing as cis women in some spaces in order to remain safe, then becoming more visible in order to resist transphobic violence. Stitching, as a metaphor, provides one way of thinking about cárdenas’ work: it’s a historically feminised practice, but also one currently practiced by those in sweatshops in the South. So using stitching as a practice is in part about learning from those who are oppressed, finding means to connect people who have formerly been separated. This can, in part, be explored through wearable technologies. Some of these, like Adam Harvey’s anti-drone Stealth Wear garments, are developed to comment on technologies of violence, but without consultation with those who experience this violence, and without an expectation that the garments will be used. cárdenas, similarly, doesn’t attempt to market garments like the mesh network-enabled Local Autonomous Networks, in part because there’s already a significant market in expensive ‘safety garments’. Instead, she focuses on exploring ideas that others might pick up on, creating new stitches to connect people and tactics. One of these projects, Transborder Immigration Tool, was described by Glen Beck as containing poetry with “the potential to destroy the nation”. Click the image to read Erhardt Graeff’s notes on the panel. The first panel I went to for the day was on #BlackLivesMatter. Catherine Knight Steele opened with ‘When the Black lives that matter are not our own’, discussing the emergence of Black digital feminism. Steele’s work draws on Squires‘ work on counterpublics, enclaves, and satellite communities to look at the ways in which Black women’s blogging practices preserve and extend practices of Black orality, establishing spaces that are open, but at the same time limited to those who understand particularly contexts. Agency: as was seen in discussions about Beyonce’s 2014 album release – the blogosphere was less concerned about whether or not Beyonce is a feminist than about her right to claim the title for herself. The right to self-identification: the politics involved in owning and operating in blackness, especially for those who have the option not to. By talking about blackness online, people can claim blackness offline.This is important for those dissociated from spaces of blackness geographically. Non-gender binary spaces: thinking about how Black women’s lives are articulated differently when it comes to gender, and decentralising notions of fertility, and maternal instincts. This also means being critical about discourses of ‘worthy victims’, and calling out Black men and others within the movement who aren’t paying attention to the violence Black women, including Black trans women, and non-binary Black people, face. Complicated allegiances: to religiousity, and to white feminists. Dialectic of self and community needs: many Black digital feminists are aware of the contradictions between one’s own needs and those of others. In large part, this comes back to capitalism, and the need to survive within it while also pushing back against it. Praxis: this is embodied in the discourse of blogging. bell hooks talks about ‘teaching to transgress’: Black digital feminists are blogging to transgress. Not just striving to understand the world, but to change it. Next up, Kishonna L. Gray talked about Gaming for Change. Gray talked about the potential that video games offer to explore different approaches to activism, and at the same time the challenges of attempting this when video games are so embedded in mainstream culture. To really use games to create change, we need to see not only games for change, but also gamers for change, and a gaming culture for change. 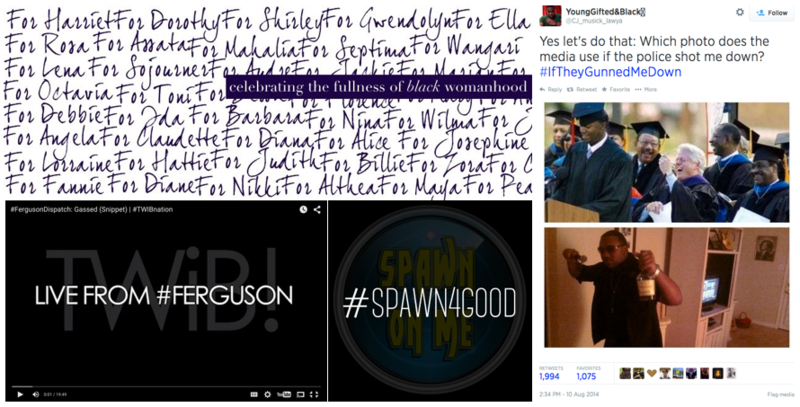 This was made clear when #Spawn4Good emerged as a response to that Online Hate Mob That Is Totally Not About Ethics in Games Journalism and Ferguson: gamers used Twitch to collect funds for Eric Gardner’s burial costs. In doing so, they faced a significant backlash from some gamers. This also happened when people attempted to create links between #BlackLivesMatter and the Ethics in Games Journalism jerks: both gamers and mainstream feminists rejected the idea that these were connected. The foundation of gaming technology reflects intersecting and overlapping racist structures that are hard for activist communities to disrupt. For this to happen effectively, acts of racial violence must be framed as something for the community to deal with, not just those affected. Blizzard, Microsoft, and other companies that run major gaming platforms need to be actively disrupting structures of racism, and at the moment they’re just not interested in doing that. In ‘Toward Social Justice, Against Media Bias, Creating Tumblr Content with Purpose Through #iftheygunnedmedown’, Jenny Korn talked about the respectability politics inherent in #iftheygunnedmedown. This response to the mainstream media’s framing of Mike Brown’s murder highlighted the racialised representation of Black people in the US. Black people are portrayed as dangerous and deviant, and therefore as suitable targets of violence. #iftheygunnedmedown pushed back at that, demonstrating that the same Black people who were shown throwing ‘gang signs’ (any hand gesture), smoking, drinking, or wearing sports wear, were also parents, graduates, responsible employees, and in other ways upright citizens. While this provides a vital critique of the racism of mainstream media, Jenny Korn also emphasises that respectability politics has its limits. It requires that Black people demonstrate their ‘value’ within the structures of whiteness before they can be excluded from racialised violence. It also privileges white comfort, trying to show that Black people are well-behaved, unthreatening. A more complete resistance to the mainstream media’s racist portrayals of Black people murdered or otherwise harmed by structures of white supremacy wouldn’t aim for respectability, but would rather value the whole of Black experience. Finally, Sarah Florini talk about This Week in Blackness and Leveraging Journalism. TWiB was created by Elon James White as an online video series, but now has a significant digital media presence, including seven podcasts, Twitter accounts, and an online TV show. TWiB has reconfigured the relationship between content creations and the audience: the audience is not distant, but much more visible and participatory. The people running TWiB are using social media not just to promote their content, but to have interactions with their audience, and build a sense of social connection. This means TWiB functions as a network in the old sense of the world – both a broadcast network, and a network of people and technology. When Ferguson happened, mainstream reporting was atrocious: at times, CNN were saying that everything was quiet, while people on the ground were reporting being attacked by police with tear gas. TWiB’s audience requested that they provide coverage, and provided donations to help. By being there on the ground, Elon James White and other people were able to get better information out, and to disrupt the mainstream media narrative: it’s hard to claim ‘all is quiet’ when someone has live video in which they’re being tear-gassed. The panel ended with a comment from the audience, which several people picked up, that we should be paying attention to #FeesMustFall protests in South Africa. I’ve been heartened to see the international attention that this is getting, and hope that this will be helpful in preventing further violence against the students. * I’ve used terms here that are most appropriate as far as I’m aware, but coming from Australia there’s a different context and background, so I may have messed up. Also I am horribly jetlagged, so please excuse any incoherence in the post – hopefully I’ll fix it up later when I have time for edits.